In Spring’15 release Salesforce added a new feature on Chatter, that is Add records to Chatter Groups. In the last article Automatically add records to Chatter Group” I had discussed the way to automate this process. 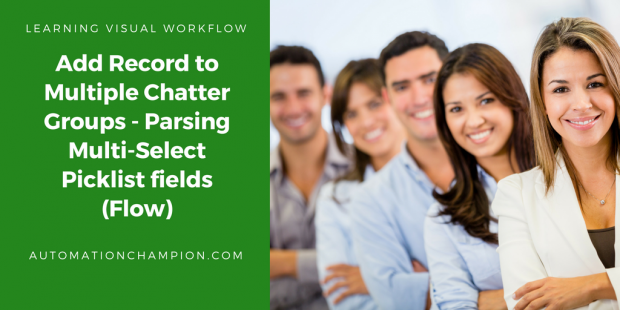 In this article, I am going to discuss how you can allow your users to add a record to multiple Chatter Groups and I am also going to discuss a way to parse Multi-Select choice Picklist fields. Higher Management in Universal container wants to expand new feature “Add records to Chatter Groups” for their users. Basically, they want a publisher action on Opportunity object that allows their users to add a record to multiple Chatter Groups (Only public Groups). Do you think we have to use Apex code to parse values selected for multi-select choice fields in flow? I think no, this article will help you to understand the way to assign multi-select choice picklist values to a collection variable in a flow or way to parse it. Design: – when a user clicks on publisher action on Opportunity object it will pop-up a screen, then the user can select multiple Chatter groups, after clicking on Next button it will add Opportunity record to Selected Chatter Groups. To solve this requirement we will use Visual Workflow, and then we will embed Flow to a Visualforce page to call it from Publisher action. Before proceeding you have to understand CollaborationGroup and CollaborationGroupRecord objects in Salesforce. A. CollaborationGroup:- This object represents a Chatter group. B. CollaborationGroupRecord:- This object represents the records associated with Chatter groups. CollaborationGroupId represents Id of Chatter Group and RecordId represents ID of the record associated with Chatter Group. 2. Click on New Flow, it will open flow canvas for you. Create two Text type variable VarTOpportunityID (To pass Opportunity ID from Publisher action) and VarTSelected_Chatter_GroupsID we will use it later on this flow. Note:- Don’t save the selected Chatter group IDs, because if you assign the results to a variable here, that variable will only store the first value selected. 14. Save the flow with name Add Record to multiple Chatter Group and close the canvas. Once done Click on Next button. Note:- In the next article Call a flow from publisher action I will show you how you can use this flow as Publisher action. I will suggest you Implement this first on your developer org test it and then move it to Production. Hi, I am building a similar flow but for some reason I am not able to pass the selected id’s from the dynamic choice to a text variable. Any advice or idea where it could go wrong? (I am using the new Lightning Flow Builder) Thanks! Please check the Data Type of variables. Hi Rakesh, I checked the data type of my variables. The variable where I want to store my id’s is a text variable. The dynamic choice is a record choice set of data type text where I use the name as label but the id as value. Does it set up as Input and Output? Hi Rakesh, I found my error. I used the choice instead of the screen component. Now it works! Thank you for your nice workarround! post.Could you please provide it? Added screenshot Formula for your reference. Where are you creating the formula field? Inside the flow? If not in the flow, what object? Thank you! Jen, I am creating it inside the Flow. Thanks for this post! Very helpful. In step 8, what formula are you using to remove the selected ID from the variable? Will mass update in flows hit governor limits? Say for eg, the user selects 10K records to be updated using a flow, will it hit the governor limit of Maximum 10K DML operations per transaction? Please clarify. Thanks. AFAIK standard pick-list limitations also to applies to Flow. Is there anyway to pass the selected pick list values to a collection instead of a variable? That way you could just use the loop function for creation of records.